Business stuff fascinate me. I've been an online entrepreneur since early 2009 and this blog is basically an account of my experiences with different retail businesses. In particular, I like reading about how individuals and companies started small and took their humble businesses to the next level. Another topic that I find interesting deals with branding -- how companies have made their products and services stand out from their competitors and how they attracted a loyal following. When it comes to improvements in the retail sector, I want to see better handling of customer complaints and more knowledgeable sales personnel and customer support staff. Anyway, if you're into business and marketing as well, there's an upcoming event that you might wanna check out: the 21st National Retail Conference (NRCE) and Stores Asia Expo. 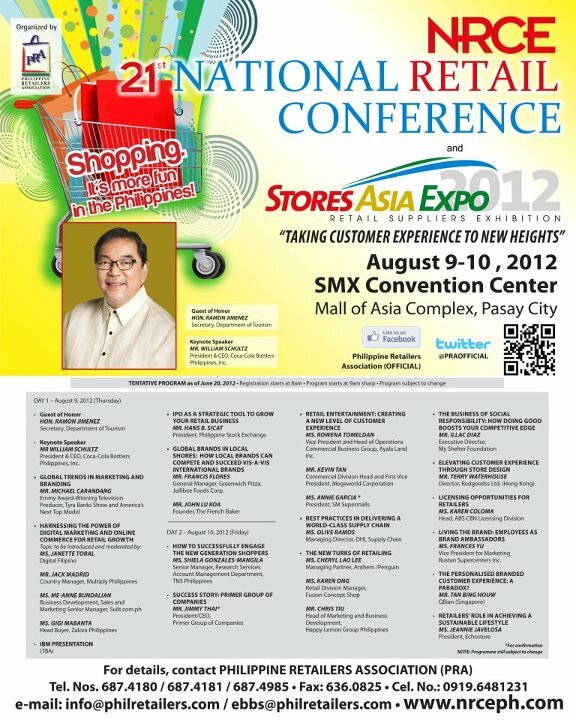 NRCE is the country's biggest retail industry event. Each year, the conference invites retail industry experts to cover important retailing topics. The 21st NRCE will be held on August 9 and 10 at the SMX Convention Center in Pasay City. Its twin event, the Stores Asia Expo, will showcase retail suppliers and service providers. This year, The Philippine Retailers Association (PRA) will highlight why it's more fun in the Philippines by combining NRCE with our tourism department's "It's More Fun in the Philippines" campaign. Tourism Secretary Ramon Jimenez will speak on how the campaign works alongside retail industry growth and a more fun shopping experience. Coca Cola’s President and CEO William Schultz will be the keynote speaker on the first day of the conference. When it comes to branding, Coca-Cola is definitely on top, not just here in the Philippines but worldwide. The 2-day NRCE and Stores Asia Expo will be attended by more than 800 retail owners, suppliers, CEOs, and top executives. Topics that will be covered this year include strategies for driving growth and customer engagement, the use of initial public offerings (IPO) to drive retail business growth, shopper engagement, as well as the use of store design and licensing opportunities for retailers to boost customer experience. Personalized branding and transforming employees into brand ambassadors will also be covered and attendees can expect to gain more insights on the competitive edge of socially responsible businesses and the retailers' role in advocating a sustainable lifestyle. (afternoon) “Global Brands in Local Shores: How Local Brands Can Compete and Succeed vis-à-vis International Brands"
Click here to register online and here to view the complete conference program. The 21st NRCE is sponsored by PLDT Alpha Enterprise, SM Department Store, Hewlett Packard, Robinsons Malls, Araneta Center, Ayala Malls, Meralco, IBM Philippines, DHL Supply Chain Phils., Inc., Festival Supermall, Wilcon Depot, Celine, The Philippine Star, BusinessWorld, ABS CBN, Schutzen, Mobext, Inc., Crossover 105.1., Entrepreneur, Focalcast, Q Creatives, Cylix Technologies, Mediamagnet, Catalyst Media, Infinite Grafix, Travel Club, APL Logistics, Avolution, Live Media, Starmall and Bayantel. Great news to many entrepreneurs! !